In all seriousness, though…the wigs are back. In fact, Fields and Weisberg kick season 2 off with a sequence in which Philip kills a few people–innocent bystander included–gets his wig ripped off, and seems shaken as he drives away. This is the mark of a man who’s become increasingly hardened by the job, and the rest of the episode deals with who exactly our characters are. This is a stellar premiere that explores something that was bound to be explored eventually: the kids. 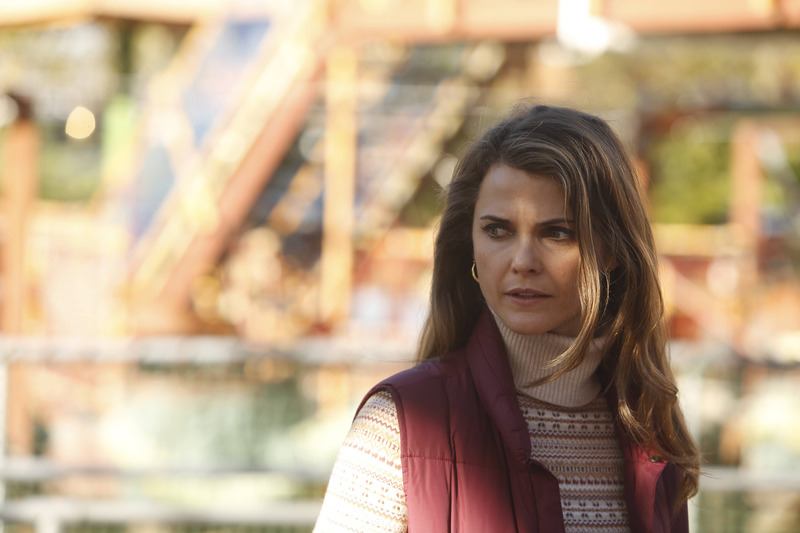 Now, we all know the risks of mishandling a “kids” storyline–ahem, Homeland–but from what I’ve seen so far, The Americans has a clear sense of where it’s going with this. It seems as if this season is going to explore the concept of family and the very real fear of losing your kids to the spy’s way of life, and right from the first sequence–which already sets this up symbolically with Elizabeth nearly hitting some deer–Rhys and Russell are perfect. Even when they’re just talking to Emmett and Leanne, it’s pretty heartbreaking to see them really want to make things work and really want to get lulled into a sense of security, but then they’re reminded of what they do. These are people who are able to enjoy moments of intimacy, but they’re also living a life of fear and suspicion and intrigue. Emmett and Leanne’s family–with their aspirations and their desire to hold onto their kids–serves as a mirror into their own lives, a wake up call of sorts. The problem is that Philip and Elizabeth have known the dangers all along, but have been able to avoid them (even as they’re having threesomes and shooting people). The slaying of the family is particularly gut-wrenching not because it’s a plot twist, but rather because it strikes at the core of the Jennings family. In particular, Matthew Rhys is perfect there when Philip obviously wants to stop the son, but can’t for fear of blowing his cover. It’s yet another illustration of the various internal and external conflicts arising from their situations, and those quick, subtle moments make it all the more devastating. Then, Philip ends up pouring his heart out to Martha as Elizabeth sits alone in their house, and it’s yet another twist of the knife. The show is full of people with relationships rooted in lies, yet the emotion in each one feels absolutely genuine. Tricky and compelling stuff here, which is why I love this show so much. It’s going to be an exciting few months ahead. -How did a 69 scene make it onto basic cable? Not complaining, though. -Stan Beeman’s back, and the episode does a nice job of looking into his relationships with Sandra and Nina. Although his storyline is usually the least compelling aspect of the show, it still makes for some really nice moments: Sandra reaching out to him, and Nina cutting down Meryl Streep. Oleg’s a “bad mattress…too soft.” I’m interested to see the role he plays in the upcoming episodes. -My guess? Claudia has something to do with the murders. I hope to see Margo Martindale soon; too bad she’s on that awful sitcom over at CBS. -Woo. We’re back. Join me as I cover every episode every Wednesday night. Looking forward to watching along with you all. I only watched one episode of this series last year. Based on you covering this new season, I think I’ll get caught up. Nice! It’s well worth it. Hey – I did get through the first season as promised. I have mixed feelings – I really like the story but really dislike the style and production values.I am annoyed by the blackouts between scenes. I don’t like Stan Beeman at all. I find it quite disconcerting in keeping up with the changes by Philip and Elizabeth as they go through their various permutations to accomplish their goals.. I am also put off by the violence. But as you have described, the meat and potatoes of this series is really in digesting the visuals to taste its flavorings. Big fan of the show. Really like where it’s going. Good review. Thanks! How far are you in the season? Philip has just got a really new nice car. Can’t be far from the end actually. I really do like it. I sure hope it doesn’t do a Homeland! Oh, nice. You’re just about to watch “Martial Eagle” then, one of my favorite episodes.